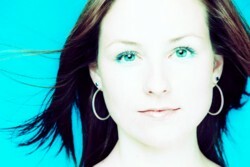 Until relatively recently Julie Fowlis was best known as a talented instrumentalist, her piping skills having been learned in her native North Uist, and at University she specialised in the oboe. The fact that Julie also has a beautiful singing voice was kept from us.Since becoming vocalist with the band Dòchas, the full range of her musical talents has now been revealed, and as a consequence the Gaelic music scene is all the richer. Isa MacKillop, her primary school teacher in North Uist, provided much of Julie’s early grounding in Gaelic song and remains a friend and mentor. Julie was greatly influenced by her upbringing in the Outer Hebrides and so it is little wonder that the bulk of the songs on this, Julie’s first solo album, are from the rich Uist song repertoire. These songs, and Julie’s interpretation of them, are a sheer delight. There are also three instrumental tracks on mar a tha mo chridhe which serve to remind us of Julie’s tremendous prowess as an instrumentalist. As alluded to in its title, mar a tha mo chridhe or ‘as my heart is’ this album brims with passion, pathos and intimacy. A member of award-winning Scottish sextet Dòchas, Julie is a young singer and multi-instrumentalist from Scotland's Outer Hebrides. Involved in singing, piping and dancing since her childhood in a Gaelic-speaking community, Julie's solo career escalated in 2005 with the release of her first solo album and achievement of the Scots Trad Music Gaelic Singer of the Year Award. "Tha mo ghaol air àird a' chuain" "My love is on the high seas"
"Dìon mo ghràdh 'th' air àird a' chuain" "Protect my love on the high seas"
Thill mi slàn bhàrr àird a' chuain" I have returned to you from the high seas"
Bidh ur drama dhuibh cinnteach" Your dram will be certain"
'Steach gu acarsaid na Sròm When approaching Strome's anchorage? Gu dè feum a th' anns a' bhròn What is the point in sorrow? A' spìocaireachd ri fuaite riu'? Was ever found in them?